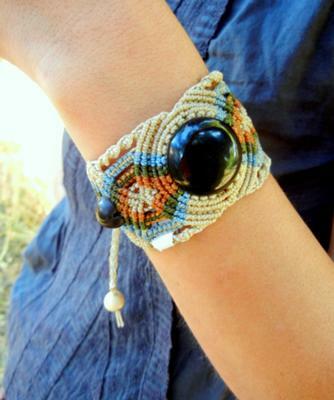 I'm looking to make cuffs like the picture and hoping to find a pattern for a macrame wrapped stone to put in a bracelet, so without the loop of cord at the top. I'm guessing I just need the stone web and then I can move on to each side from that? If you're advanced in micro macrame technique - basically what you need to do is make a cinch wrap to go around the outside edge of the cabochon and tighten at the top. This can be done by having a left and right steady cords and use one or two inside cords wrapping back and forth around the two outside (left and right) cords to make like a ladder. Fit around the cabochon as necessary cinching cords at the top tying knots to hold in place. Now you can either account for cord lengths by having excess cords hanging from one side of the ladder to do your macrame with or you can insert cords onto the stitches of the wrapping.